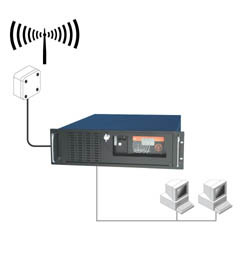 Connecting directly to Ethernet the Galleon Rack Mount NTP Time server will provide a NTP time server to synchronise the time for yourwhole network using the industry standard Network Time Protocol (NTP). It incorporates a Galleon Server Atomic Radio Clock (which collectsthe time signal from the Labaratory in rugby) and a NT workstation. Load the NTP client either TimeSynch for Windows machines or a NTP client for UNIX, NOVELL 5+, etc. Set the IP address for all your NTP clients to synchronise from the Galleon rack mount NTP Time server. You can synchronise any other equipment that conforms to NTP (Network Time Protocol) or SNTP with time broadcasts, multicasts, or uni-cast time Synchronisation. Simple to install, easy to use. The sing time from the atomic clock in Rugby is accurate to fractions of a second this ensures atomic clock accuracy for your computernetworks. Receiving this Radio Time signal from Rugby provides a time server for your Windows network that is secure because it´s behindyour firewall so maintaining your network security and integrity. 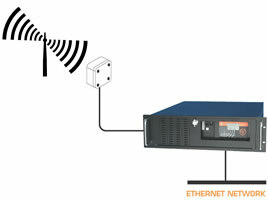 Connects directly to Ethernet, fits in a standard 19" rack, incorporates a Galleon ServerARC Computer Clock with remote antenna that canbe positioned up to 500 ft (150m) away with LED signal strength display for easy installation, an integral time display, serial interface,a NT workstation, Ethernet CAT5 connection, power supply and TimeSynch NTP network time server Software driver for uni-cast, broadcast ormulti-cast time Synchronisation and includes a 10-user TimeSynch (SNTP client) license. Guaranteed to provide an accurate time signalanywhere in the World. All types of organizations all over the world (America, Europe, Australia, and the Middle East) are already using Galleon Atomic RadioClocks; we synchronise time across the globe for organizations as diverse as NASDAQ to Kellogg's. Other customers include Daimler Chrylser,3M, GlaxoSmithKline, Buckingham Palace, Sharp and Shell.